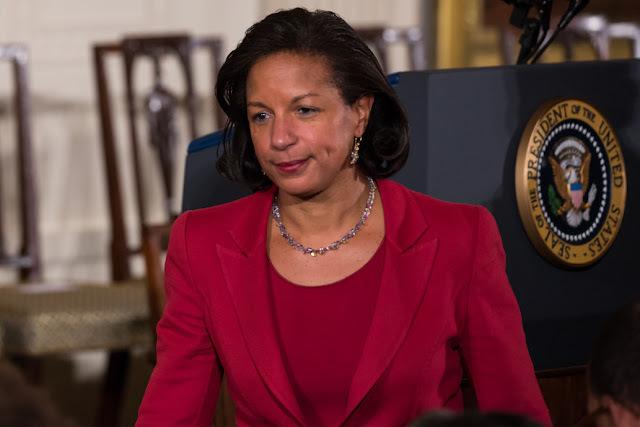 Former President Obama’s national security adviser Susan Rice asked for the identities of Americans in intelligence reports that are connected to officials on President Trump’s campaign and transition teams, according to a report Monday citing US officials. A National Security Council review of the government’s policy on “unmasking” the identities of Americans caught up in incidental surveillance revealed Rice’s requests, Bloomberg reported. The identities of citizens collected are normally redacted from the intelligence reports and are designated as something like “US Person One,” Bloomberg reported. Ezra Cohen-Watnick, the NSC’s senior director for intelligence, uncovered Rice’s multiple requests related to the Trump transition in February while conducting the review and alerted the White House General Counsel’s Office, which undertook another review of Rice and told him to stop his investigation into the unmasking, the website reported. The intelligence documents contained summaries of conversations monitored between foreign officials talking about the Trump transition. They also contained some instances of communication between Trump associates and foreign officials, the report said. The data, according to a US official, included sensitive information about whom the Trump associates were meeting and their views on foreign policy issues. Rice did not respond to an email seeking comment, the website said. During an appearance on “PBS NewsHour” on March 22, Rice was asked about whether Trump transition officials were swept up in incidental monitoring. “I know nothing about this,” she said. House and Senate committees are investigating Russian involvement in the 2016 presidential election and whether Trump associates had any contact with the Kremlin during that time. The FBI is also currently investigating Russia’s interference. Trump claimed in a tweet on March 4 that Obama “had my ‘wires tapped’ in Trump Tower,” but did not offer any proof to back up his claims. White House officials have pointed to reports in the media citing anonymous sources about possible surveillance. But FBI Director James Comey and National Security Agency Director Mike Rogers testified before the House Intelligence Committee and said they had no information supporting Trump’s claim. Rep. Devin Nunes, chair of the House panel, said March 22 he received information from sources that showed members of the Trump transition team’s communications were caught up in “incidental collection” after the election.